Blame, Sway, and Vigilante Tactics: How Other Cultures Think Differently and Implications for Planning. Author | Editor: G. Sutherlin (Geographic Services, Inc.). Planners require context in order to achieve their goals. While planners understand that colder or more elevated locations have implications for an operation, the capacity to similarly adapt plans and operations based on differences in the population’s cultural or cognitive attributes has not been as readily integrated. 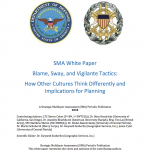 The purpose of this SMA White Paper is to synthesize ideas across cognitive science and applied social science and translate their application for use in operations and planning within the span of a single document. The contributors each look at distinct cognitive functions that merit attention. 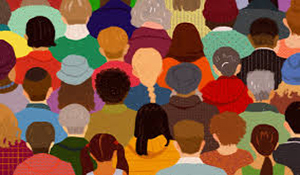 By translating or operationalizing the research and discussing it in terms of real-world scenarios, this paper illustrates how the addition of cultural cognitive diversity research will enable more effective, quick, less violent, and less expensive operations.